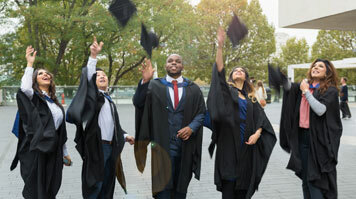 Students from London South Bank University (LSBU)'s School of Business have celebrated graduation at the Royal Festival Hall at a ceremony held on Monday 19 October. This year’s graduating class saw the launch of the Business School’s Bloomberg Centre, a facility that enables students to access real-time information, documents and data used by companies, traders, analysts and governments around the world. It will provide them with a significant competitive advantage and will help them to stand out in the UK and international job market. As part of the ceremony, independent energy consultant and LSBU alumnus Mick Jarvis was awarded the title of Honorary Doctor of the University. Mick Jarvis graduated from what was then South Bank Polytechnic in 1975 with a degree in Business Studies, and has maintained close links with the University ever since, giving generously of his time and sharing his deep knowledge and experience of the energy industry. Former Chief Executive of Lambeth Council and long-standing public servant Derrick Anderson CBE was also awarded the title of Honorary Fellow at the ceremony. Since his retirement, Derrick has been working with aid and development organisations in southern Africa and the Caribbean. He was awarded a CBE for services to local government in January 2003. Find out more about studying in LSBU’s School of Business.